We don’t keep a television in the bedroom, but I love to fall asleep on the couch. Sometimes the voices and music of TV shows is easier to fall asleep to than just about anything. But sometimes you find a show that instead keeps you wide awake and engaged, even if you were half-asleep moments earlier. You, Me, and the Apocalypse is one of those shows. It’s got so many moving parts and so many interesting characters that you can’t stop watching for fear of missing something. 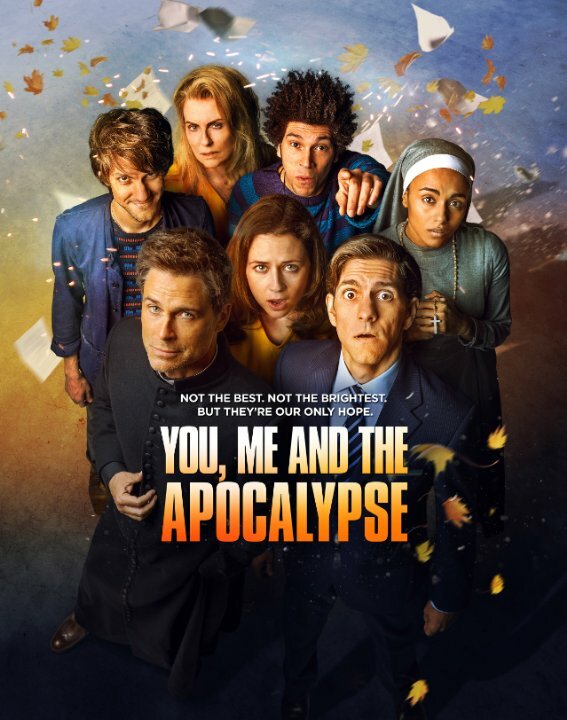 Jamie is a bank manager in Slough, England who discovers that not only is the world ending but that he has a secret twin, he is adopted, and his vanished wife may not be vanished. He and his friend head off to uncover the truth. Ariel is Jamie’s secret twin, a hacker and all-around bad guy. He’s only out to save his own skin. Rhonda is a librarian taking the fall for her hacker son’s activities. She is broken out of prison amid the chaos and finds herself on the lam with a white supremacist named Leanne. Father Jude is a chain-smoking priest (played by Rob Lowe) who has been hired by the Vatican to fulfill the newly-reopened role as Devil’s Advocate, who seeks to confirm miracles. He is joined by the very pious Sister Celine. There are lots more characters and they are all starting to intertwine. What’s great is that none of it has gotten confusing. It’s just getting more fascinating as you try to figure out what’s going to connect and how it will all lead to the bunker. Great new show that is worth staying awake to watch.